مکی زاده, وحید, ابوالحسینی, نیما. (1397). الگوی مفهومی عملکرد اتحادهای استراتژیک با رویکرد مدلسازی معادلات ساختاری (مورد مطالعه: صنعت نفت). بررسی‌های بازرگانی, 16(شماره 90-91), 93-107. وحید مکی زاده; نیما ابوالحسینی. "الگوی مفهومی عملکرد اتحادهای استراتژیک با رویکرد مدلسازی معادلات ساختاری (مورد مطالعه: صنعت نفت)". 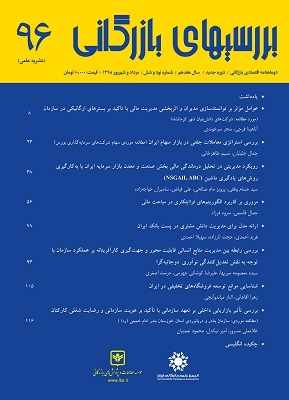 بررسی‌های بازرگانی, 16, شماره 90-91, 1397, 93-107. مکی زاده, وحید, ابوالحسینی, نیما. (1397). 'الگوی مفهومی عملکرد اتحادهای استراتژیک با رویکرد مدلسازی معادلات ساختاری (مورد مطالعه: صنعت نفت)', بررسی‌های بازرگانی, 16(شماره 90-91), pp. 93-107. مکی زاده, وحید, ابوالحسینی, نیما. الگوی مفهومی عملکرد اتحادهای استراتژیک با رویکرد مدلسازی معادلات ساختاری (مورد مطالعه: صنعت نفت). بررسی‌های بازرگانی, 1397; 16(شماره 90-91): 93-107. تشکیل اتحادهای استراتژیک یکی از مهم ترین استراتژی های بنگاه‌ها در صنعت نفت و صنایع وابسته آن می باشد. از این رو ارزیابی عملکرد آنها نیز یکی از مهمترین عرصه‌های مطالعاتی به شمار می‌رود. به همین منظور در این تحقیق الگوی عملکرد اتحادهای استراتژیک با درنظر گرفتن تاثیرات تنوع اتحاد ارایه شده است. 113 پرسشنامه در میان بنگاه‌های مشارکت‌کننده در اتحادهای استراتژیک صنعت نفت، گاز و پتروشیمی توزیع شد که 73 پرسشنامه قابل استفاده برگشت داده شد. پایایی متغیرهای مکنون همگی در بازه قابل قبول قرار دارد. برای آزمون مدل نیز از روش کمترین مربعات جزیی و نرم افزار Smart PLS-Graph نسخه 2.0 استفاده شد. نتایج نشان داد که تجربه اتحاد بر قابلیت مدیریت اتحاد و عملکرد اتحاد اثر مثبتی دارد. همچنین تاثیر قابلیت مدیریت اتحاد بر مزیت رقابتی و عملکرد تایید شد. اثر مزیت رقابتی بر عملکرد نیز تایید شد. اما اثر تنوع بر عملکرد اتحاد رد شد. تفکیک آثار نشان داد که تجربه اتحاد تاثیر بسزایی در عملکرد اتحادها دارد. داوری، علی، رضازاده،آرش. (1392). "مدل‌سازی معادلات ساختاری با نرم‌افزار PLS". سازمان انتشارات جهاد دانشگاهی. Angelo Canzaniello, Evi Hartmann, Matthias S. Fifka. (2017). Intra-industry strategic alliances for managing sustainabilityrelated supplier risks: motivation and outcome. International Journal of Physical Distribution & Logistics Management, 47(5): 12-51. António, F., & Mário, F. (2017). he Mediating Effect of Intellectual Capital in The Relationship Between Strategic Alliances and Organizational Performance in Portuguese Technology-Based SMEs. European Management Review, 14(3): 303-318. Beamish, P.W., Lupton, N.C. (2016). Cooperative strategies in international business and management: Reflections on the past 50 years and future directions. Journal of World Business, 51(1):163-175. Brookshire, J. (2009). Capabilities, Competitive advantages, and Performance of Apparel import intermediaries in a Hyper-Dynamic Market Environment. Unpubished Phd dissertation. University of Carolina. Duysters, G.M., & De Man AP. (2007). The Second State of Alliance Management Study, White Paper for the Association of Strategic Alliance Professionals. Ferreira, A and Franco, M (2017). The Mediating Effect of Intellectual Capital in The Relationship Between Strategic Alliances and Organizational Performance in Portuguese Technology-Based SMEs. European Management Review,14(3), 303-318. Gomes, E., Barnes, B.R., & Mahmood, T. (2016). A 22 year review of strategic alliance research in the leading management journals. International Business Review, 25(1): 15-27. Heider, A.S., & Eriksson, L.T. (2009). Success is not enough: The spectacular rise and fall of a strategic alliance between two multinationals. Industrial Marketing Management, 34(8): 783–796. Heimeriks, K.H., & Duysters, G.M. (2007). Alliance Capability as Mediator between Experience and Alliance Performance: An Empirical Investigation into the Alliance Capability Development Process. Journal of Management Studies, 44(1), 25–49. Heimeriks KH, Duysters GM, Vanhaverbeke W. (2009). Learning mechanisms and differential performance in alliance portfolios. Strategic Organization 5(4):373-408. Heimeriks, K. (2007). Developing alliance capability (Master Thesis). Retrieved from TU/e Eindhoven Dissertation and Theses database. Hoang, H.T., & Rothaermel, F.T. (2007). The Effect of General and Partner-Specific Alliance Experience on Joint R&D Project Performance.Academy of Management Journal, 48(2), 332–45. Hoffmann, W.H. (2008). How to manage a portfolio of alliances. Long Range Planning, 38,121-143. Jiang, R.J., Tao, Q.T., & Santoro, M.D. (2010). Alliance portfolio diversity and firm performance. Strategic Management Journal, 31, 1136–1144. Kale, P., & Singh, H. (2009). Building Firm Capabilities through Learning. Strategic Management Journal, 28(10), 981–1000. Lavie, D., & Miller, S. (2010). Alliance Portfolio Internationalization and Firm Performance. Organization Science, 19(4): 623-646. Leeuw, T. D., Lokshin, B., & Duysters, G. (2013). Returns to alliance portfolio diversity: The relative effects of partner diversity on firm’s innovative performance and productivity. Journal of Business Research, 67(9): 1839-1849. Leonidou, C.N., Leonidou, L.C., Coudounaris, D., & Hultman. (2013) International Business Review. 22(1):156-173. Lucena, A., & Roper, S (2016). Absorptive Capacity and Ambidexterity in R&D: Linling Technology Alliance Diversity and Firm Innovation. European Management Review. 13(3): 159-178. Martinez, M.G., Zouaghi, F., & Garcia, M.C. (2016). Capturing value from alliance portfolio diversity: The mediating role of R&D human capital in high and low tech industries. Technovation. 59: 55-67. Murray, J.Y., Gao, G.Y., & Kotabe, M. (2011). Market Orientation and performance of export ventures: The process through marketing capabilities and competitive advantages. Journal of the Academy marketing science, 39: 252-269. Newbert, S.L. (2010). Value, rareness, competitive advantage, and performance: A conceptual-level empirical investigation of the resource-based view of the firm. Strategic Management Journal, 29(7): 745-768. Oerlemans, L.A.G., Knoben, N., & Pretotius, M.W. (2013). ALLIANCE PORTFOLIO DIVERSITY AND INNOVATION OUTCOMES: DOES TECHNOLOGY MANAGEMENT MATTER?. South African Journal of Science, 102(11-12): 589-593. Pangarkar, N., & Wu, Jie. (2012). Alliance formation, partner diversity, and performance of Singapore startups. Asia Pacific Journal of Management, 30(2): 422-439. Panico, C. (2016). Strategic interaction in alliances. Strategic Management Journal, 38(8): 1646-1667. Pavlou, P. A., & El Sawy, O. A. (2011). Understanding the elusive black box of dynamic capabilities. Decision Sciences, 42(1): 239-273. Rothaermel, F. T., & Deeds, D.L. (2009). Alliance type, alliance experience and alliance management capability in high-technology ventures. Journal of Business Venturing, 21: 429-460. Saebi, T. (2011). SUCCESSFULLY MANAGING ALLIANCE PORTFOLIOS: AN ALLIANCE CAPABILITY VIEW. Unpublished Phd dissertation. UPM/Maastricht. Sascha, A., Franz, W., Zajac. F., & Edward, J. (2016). Strategic Alliance Structures: An Organization Design Perspective. Journal of Management, 42(3): 582 – 614. Sampson, R.C. (2007). Experience Effects and Collaborative Returns in R&D Alliances. Strategic Management Journal, 26(11): 987–1086. Sarkar, M.B., Aulakh, P.S., & Madhok, A. (2010). Process capabilities and value generation in alliance portfolios. Organization Science, 20(3): 583-600. Schreiner, M., Kale, P., & Corsten, D. (2010). What really is alliance management capability and how does it important for alliance outcomes and success?. Strategic Management Journal ,30(13):1395-1419. Schilke, O., & Goerzen, A. (2011). Alliance Management Capability: An Investigation of the Construct and Its Measurement. Journal of Management, 36(5): 1192-1219. Schilke, O., & Lumineau, F. (2016). The double-edged effect of contracts on alliance performance. Journal of Management, First Published July 15, 2016. Shakeri., R & Radfar, R. (2017). Antecedents of strategic alliances performance in biopharmaceutical industry: A comprehensive model. Technological Forecasting and Social Change, 122: 289-302. Sluyts, K., Matthyssens, P., Martens, R., Streukens, S. (2010). Building capabilities to manage strategic alliances. The 26th IMP conference, Budapest. Terjesen, S., Pankaj., P.C. & Covin., J.G. (2011). Alliance diversity, environmental context and the value of manufacturing capabilities among new high technology ventures. Journal of Operations Management, 29:105–115. Wassmer, U. (2010). Alliance Portfolios: A Review and Research Agenda. Journal of Management, 36 (1), 141- 171. Wittmann, C.M., Hunt, S.D., & Arnett, D.B. (2010). Explaining alliance success: Competences, resources, relational factors, and resource-advantage theory. Industrial Marketing Management, 38: 743–756. Wuyts, S., & Dutta, S. (2012). Benefiting from Alliance Portfolio Diversity: The Role of Past Internal Knowledge Creation Strategy. Journal of Management.